Have you ever tried to have a date night when you have a toddler? The stars need to align perfectly for all the ingredients to come together. Is said toddler healthy? Check. Free night to have a date that lines up with sitter’s schedule? Check. Does Mama have energy to dig through her closet to find something other than the yoga pants she’s been rocking for the last 4 days? Debatable, but check. Is Venus in retrograde with a full moon on the horizon? Check. So, the stars line up… and then something happens. The babysitter cancels. Then the toddler gets sick. There’s a freak storm and then the next 6 months of evenings or weekends are busy. And there goes date night, right down the drain. So instead of going out to dinner on dates, sometimes, we do date nights at home after Goose goes to bed. We make fancy food, and drink some wine, and light some candles. It’s fun. And I don’t have to change out of my standard yoga pants most of the time. How’s that for the way to a mama’s heart? Good stuff, right? 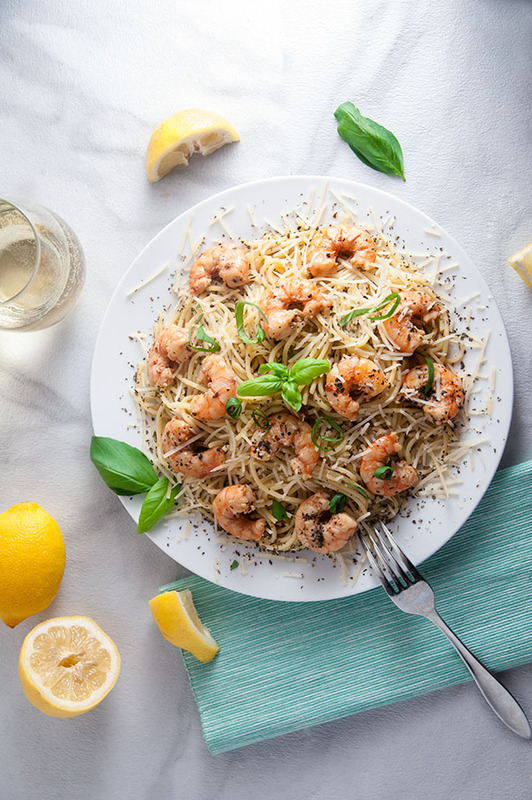 One of our favorite date night foods is shrimp scampi. Now I’ll tell you, back in our dating days, we’d been burned by some pretty tasteless scampi. We often visited the beach town where we got married. On one visit, we ate at a particularly unfortunate Italian restaurant. As he often does, my husband ordered shrimp scampi. Of course, he was expecting buttery, garlicky goodness. 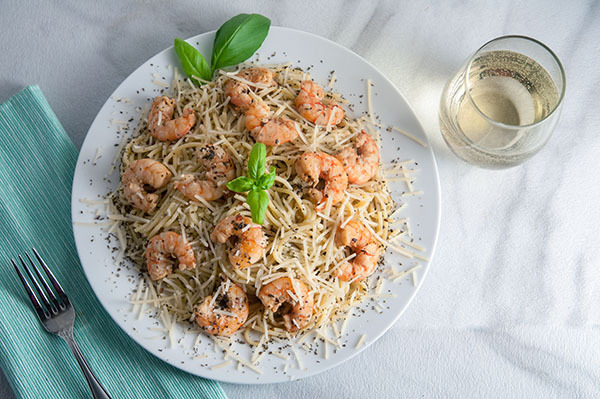 Because that’s what shrimp scampi should be. This was not. It was tiny little shrimp over pasta that tasted a lot like Cup o Noodle soup. So sad. 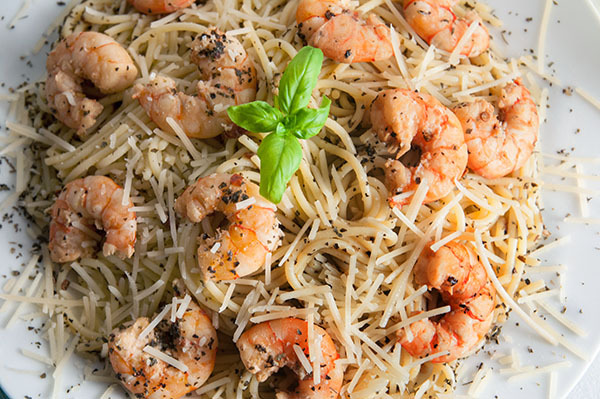 That shrimp scampi was so disappointing, that now, years later we still talk about it. 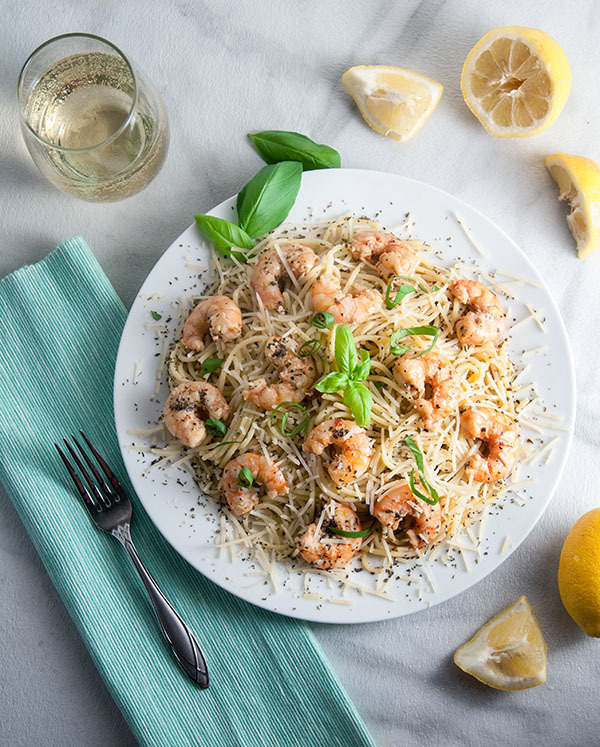 And whenever we make shrimp scampi at home, we make sure to make it with tons of flavor. Really, would you expect anything else out of us given how much this whole family love spicy food (buffalo wings, buffalo chicken burgers, spicy eggs…)? 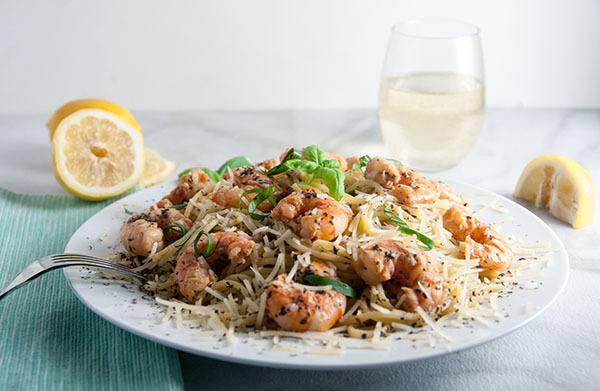 So this chipotle shrimp scampi of course is loaded with flavor and a twist. Garlic, lemon, butter, white wine, and Parmesan cheese all get cozy with a chipolte pepper. 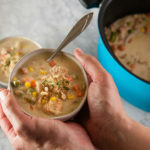 All the classic flavors are there making it the yummy classic you know and love and the chipotle pepper adds a touch of background spice and smoke. Plus, we keep it gluten free with gluten free pasta. You don’t have to, of course, but it is a huge bonus here. 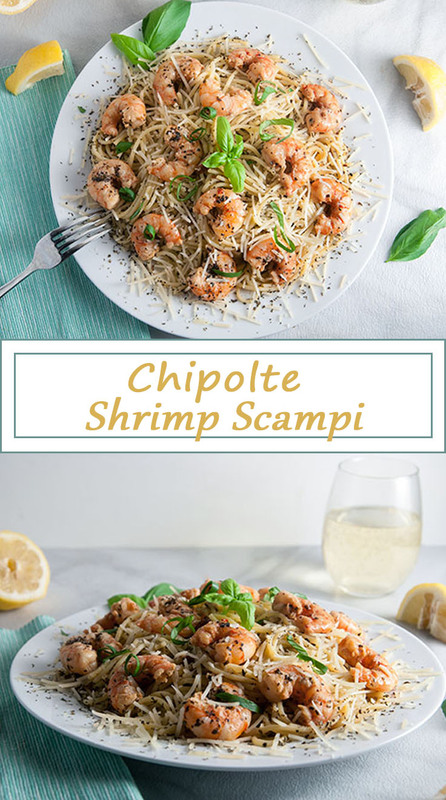 It is so good that we will be talking about this chipotle shrimp scampi just as long as we have been talking about the disappointing Cup o Noodle soup scampi. Almost as good as a romantic night at home, eating this dinner on the couch watching Netflix in yoga pants with the love of my life in his pjs next to me. Start pot boiling and follow directions on box to cook pasta, we used gluten free sphaghetti. Combine shrimp, seasonings, and wine in a medium bowl (you can marinade the shrimp for some time like this, or cook immediately). Add shrimp mixture to melted butter. Cook shrimp until pink and cooked through, about 4 minutes each side. With tongs or fork, remove shrimp when cooked leaving liquid in the pan. Turn heat up to medium high, stir frequently as liquid is reduced. This should take about 5 minutes. Reduce heat to low medium. Add shrimp, Parmesan cheese, and pasta back into pan and stir until pasta is well coated with sauce. Ok, this looks absolutely amazing! SO pinning the recipie. 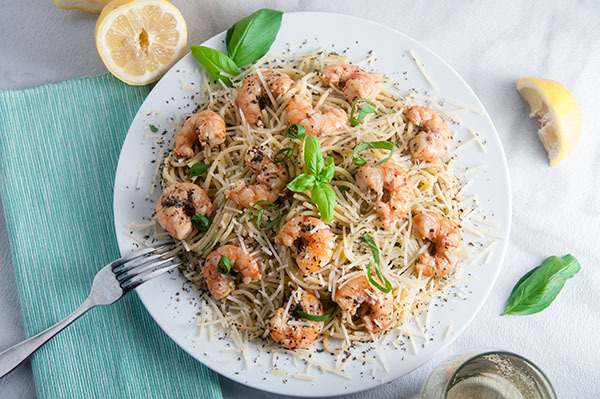 I just love that you added chipotle to traditional shrimp scampi! Sounds right up my alley. how delicious does this look? i love shrimp! adding to my recipes to make next month! I love the idea of having dinner date nights at home. I don’t know why but my husband and I never do this, maybe it’s because we don’t love cooking that much. We normally end up taking our son with us on date nights when we can’t get a sitter we trust. 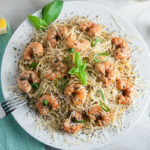 I would love to try this shrimp scampi recipe as it looks delicious. I love how you incorporated the basil. Thanks for sharing! This looks delicious!! I’m sure it would make any night special! Date nights are a rare occurrence around here, so I totally get it! 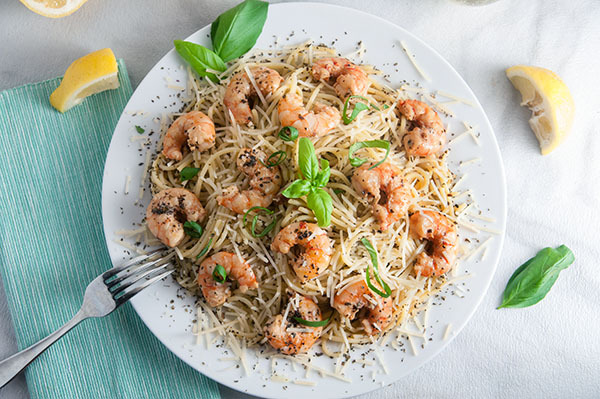 This sounds great- so much better than your cup of soup scampi-LOL! I love that you made it gluten-free! Looks like a yummy fast dish! Can’t wait to try it. Yum! This looks like dinner both my husband and I would love. Thank you! Wow!! 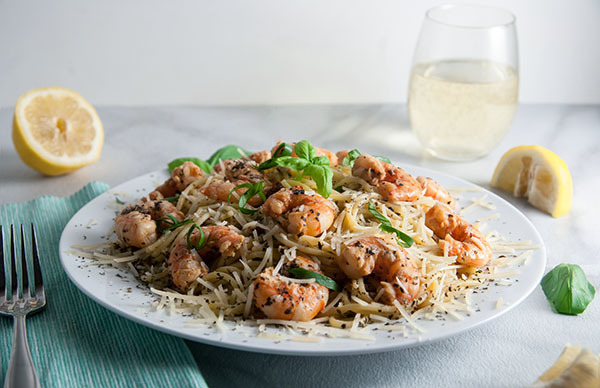 I looovvee shrimp & this recipe is right up my alley! Can’t wait to try 🙂 great pics too! 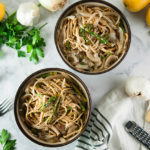 Oh my husband loves coconut so I think this is a perfect recipe for him! I’ll give it a try! WOW! That looks amazing and so up my alley! This looks amazing! Pinning this to make for later! 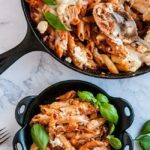 I make this very similar but never thought to add spice – I am so trying this the next time!! This looks so delicious. 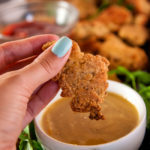 I love shrimp and I am always looking for great recipes. Pinning this for later. Thank you! This looks absolutely incredible! I need to make this!